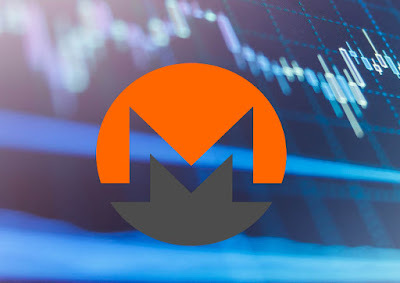 Monero XMR price up 27 percent after closing above $65, Tokenomy Exchange now support Monero (XMR). 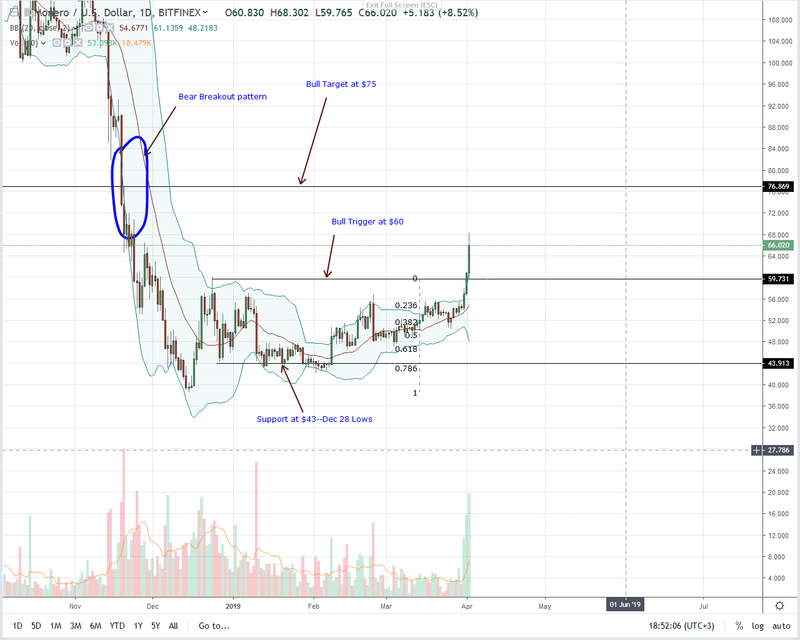 Two weeks after the Boron Butterfly upgrade, Monero (XMR) is surging up 27 percent and trending with a bullish breakout pattern. With the Boron Butterfly upgrade, the network is secure after patching Big Bang and decentralized thanks to ASIC resistance. 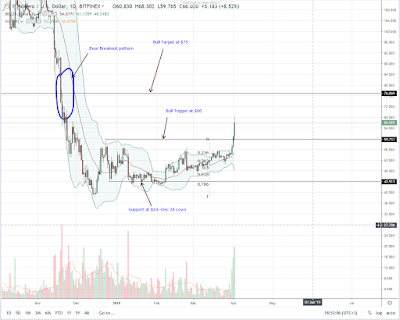 "Monero (XMR) is surging up with a bullish pattern"
Like hard, fiat money, Monero is anonymous. However, it doesn’t stop there. The XMR is perfect for the internet, is digital, blockchain based and global meaning that it bears some properties like Bitcoin but with added privacy features. With a blend of privacy, Monero XMR buying demand is on the rise and preceding today’s super rally is April 1 stellar performance. By yesterday’s close, the 13th most valuable coin was up 12 percent thanks to supportive fundamentals that Tokenomy Exchange, with bases in Indonesia, will be offering support to the world’s first privacy-centric coin. Aside from the cryptocurrency exchange listing, Monero developers are striving to make the network ASIC resistant, upgrading on many occasions to prevent ASIC miner dominance. Their last fork, Boron Butterfly, did affect the network’s hash rate confirming reports that ASIC miners dominate Monero chain as nonce pattern shows. On the chart, MoneroMonero (XMR) is up 27 percent in the last week and 12 percent in the day outperforming similar assets. However, from a candlestick pattern arrangement, there is more room for upside now that Bitcoin (BTC) prices are rallying. Besides the Bitcoin BTC surging effect, Monero is trading within a bullish pattern, and after today’s bar, we will have a whole bull bar closing above our main buy trigger level. Already, price momentum is picking up as full bar band along the upper BB after bouncing off the 78.6 percent Fibonacci retracement level of Dec 2018 high low. A look at transaction levels reveals participation. After the reversal pattern of Mar 21 losses—10k by Mar 31—30k bull bar, the ground was set for buyers. What we now have are high volume price bullish bars banding along the upper BB complete with high transaction volumes exceeding those of Feb 24, our anchor bar marking $60 resistance.